A few days ago I asked if you could spot the fake from the two products above and most of you got it right, however over a quarter of the people that left a comment either didn't know or thought the fake was the product on the right hand side. So even though there was the genuine product to compare it against alot of people still struggled to see the differences in the two product. Which just shows how hard it can be to tell a fake from a genuine item. I am hopefully going to show you the flaws of the fake Benefit Justine Case kit but if you want to know how to spot a fake Benefit product in general then just scroll to the bottom of the post where there are simplified bullet points that cover all Benefit products. Obviously this is where most of the attention to detail has been spent as the cover is nearly spot on. The slight difference is the fake product has more shading to the bag on the right hand side and the font to the "just in case" is more squashed and also darker. If you didn't have the genuine item to compare it against these things would be virtually impossible to notice. As you can see the the genuine products are bigger and also have flat lids. The product inside the bottles is also much stronger in colour in the real item. Also something that is harder to spot is one the Benefit logo (you may need to click on the image to see). The real benefit logo has no dot over the 'i' as the 'f' hangs over it, however if you look closely all the fake bottles have a dotted 'i'. Other small mistakes are the font to the 'eye'con and that the 'benetint' font shouldn't be pink. They do sneakily match the real product with the writing on the side word for word and also there is numbering on the bottom which is the same as the real product. Which I am sure would convince someone it wasn't a fake when it infact is. Again when you compare the two items side by side you can spot the difference a mile off, however take the real one out of the equation and you are left with fake products that actually smells the same as the real thing. Even though the Benetint is different in colour it does smell very similar as does the California Kissin' they just aren't as strong. Consistency wise they are almost spot on. As for Some Kind-A Gorgeous which normally has a cream to powder finish, it is quite abit more thicker and sticky as for colour they are quite similar. On a side note other than swatching the fake products on the back of my hand I will not be using any of them mainly for the fact that the company that manufacturers these isn't bound by any laws or standards and therefore the ingredients in the products are unknown. So as I know that the item is a fake I will definitely not be using it. Now this is where it is more obvious, there are just too many flaws. Which is one thing to always look out for, as the packaging will be more cheaply made than the real item and most of the time rushed. The mirror is slightly off at the bottom and there is glue residue at the top of the packaging as you can see above - however the imperfection isn't as noticeable as the image I took makes out. Also the casing for Some Kind-A Gorgeous is poorly fitted but if you were to compare this, there isn't much between them. This is also quite an obvious one if you have ever had Benefit kits before the ribbon to lift the miniature products out is always cut at an angle and is red. This applies to all Benefit products with silk ribbons. Simple. Another mistake below is the missing code that should be on the back of the product, everything else is word perfect even the correct company address. But it is missing the product code. Anyway enough about this specific product as I am sure most of you aren't planning on just buying Benefit Justine Case in the future. So there are a few things to look out for before purchasing Benefit products from Ebay or discounted websites. (As I am not going to warn you away from eBay or discounted site as they do have there place on the internet and I shall personally continue to use them). If you are wanting to purchase a Benefit item from eBay have a look to see if the seller is selling alot of Benefit products. As most sellers that sell fake items sell multiples weekly. Avoid stock images like the plague...if it isn't the actual image of the product be wary as most people do own a digital camera these days. Make sure they have a returns policy! I would say to look at feedback, however alot of the sellers have 100% positive feedback as no one has noticed they have been sold fake goods. It is still worth looking at though. If they is an actual image of the product or when the item arrives make sure to have a look at the Benefit products on Asos.com as you can really zoom into the products to compare the real product against your own. If you are still unsure about the authenticity of the item take it too a Benefit counter to compare it to the actual product - But be aware you may receive dirt looks from the Benefit MUA's by doing this! Usually if the item is being shipped from another country other than where you live it is likely to be a mass produced fake item. However there are quite a lot of UK sellers that list fake items. If you receive the item and find that is it in fact not genuine make sure to email the seller or company ASAP outlining that it is fake and that you want a full refund. Finally, common sense is key. The main thing to look for is the quality. The quality of higher end products is always good and this is where alot of fake goods slip up as the materials that make up the fake products are the cheapest of the cheap and also tend to be poorly made. I hope you have found this slightly informative and if you have purchased anything at a discounted rate whether is be Benefit or not, make sure to have a detailed look over it as you wouldn't want to be using fake untested products on your face! My sister fell into this trap when repurchasing the 'Big Beautiful Eyes' set. luckily she'd had it before and so was easily able to tell the difference...But like you say, they make such an effort with the packaging etc that if it was someones first time buying a product, they would believe it to be real. I think some sort of deal should be struck between cosmetic companies and ebay in relation to their products being sold, as there's just far too many fakes about and too many people being conned out of their money. WOW! !Thank you soo much!This helped allot! i can't believe how similar they look! thanks for doing this post, i honestly couldnt tell the difference as this was the first time i was going to try benefit products! Instead of ebay i think ill wait and get from the shop. wow thanks so much for all the helpful hints. i'm always looking at MU to buy online & this makes me take a closer look at what's being sold. great post! Amazing tips! I will now be able to tell the difference! Its ridiculous the way they fake items and its horrible to think people are using them not knowing its fake puting all sorts of bad things on there face! eek! @me :) - Really good point about checking what else the seller is also selling - I do, do that and it really does help to see if they are selling mulitiples of the same product! I shall have to add it onto my post :) so thanks. As for how Benefit distribute there products its a tough one as like you say they only sell to big chains and websites but I am sure that people can purchase them quite cheaply in bulk order maybe and then decide to sell them on and also afew fake sellers sell there items as un-wanted gifts! But it is a good point! I totally agree with all that you wrote in this interesting post. When I pèurchased some benefit prodcuts I unsterstood that they were fake looking at these particlulars. Fake products always annoy me .. I'm glad you pointed out the ways to steer clear of them. i'v been looking at benefit products on ebay recently and this is really very useful to me! 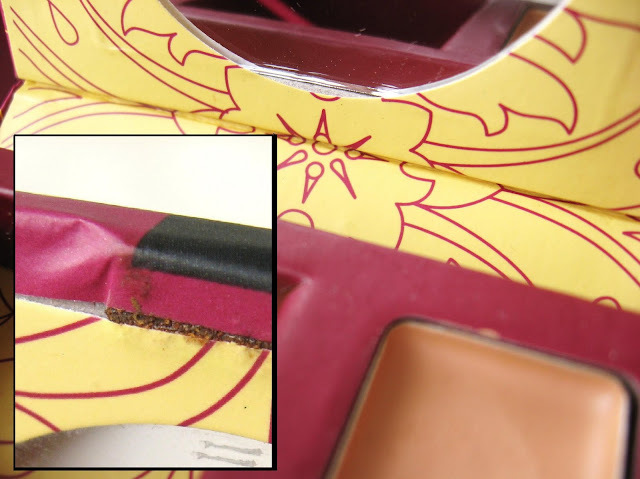 I bought the benefit smokin eyes off ebay very cheaply because it didnt even occur to me that there was a such thing as fake make-up. When it came in the post the packaging is actually identical to the smokin eyes i bought from the airport a while back. the only difference is is that the brush was shorter and the eyeliner was longer. the instruction booklet was also slightly larger. the seller says that it is a factory second but im confused if there is even a such thing. as for the contents i did one eye with the smokin eyes i bought from the airport and the other with the one from ebay and no word of a lie it is exactly the same. This has left me seriously confused as to if it is a fake or not. has anyone else heard of benefit factory seconds? Yeah what is factory seconds? I am now hunting for cheaper benefit as I cannot afford the ones at the store..but have to be very careful! I'm not sure if i can comment on such a old post but i do believe this Australian Ebay seller is selling fake Benefit, Mac and other beauty products... she has non-stop listings. This is one of the most helpful sites I have found on this matter. I also purchased a Benefit product on ebay and came across the Youtube videos about counterfeit Benefit products for the first time the day after purchasing it. I waited for it to arrive, fingers crossed, and it is in fact a fake. On a positive note, this opened my eyes to the care and quality control that go into making these genuine higher end cosmetics, showing exactly why they cost as much as the do. And also that they are worth it. I just received a fake benefit BIG BEAUTIFUL EYES!! The seller was claiming that it's genuine but you can obviously see how poorly the packaging is made, the details on it are wrong, everything is of poor quality... unfortunately I can't get a refund ;/ Beware ladies!! !